Indonesia wants to open more sectors for foreign investment! But with limitations, which are not yet defined in detail. Why did Indoconsult not report any news about the opening of the Indonesian market for foreign investors? Even if there was a big press conference on 11th of Feb presenting the 10th economic package in Jakarta. We have received this questions quite frequently yesterday and today from our followers and here comes the answer. 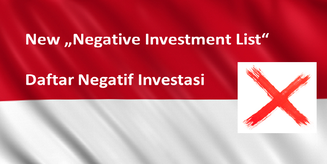 We really appreciate that Indonesia is planning to revise the negative investment list (DNI) and that many of the planned changes have been proposed in the latest economy policy package released on 11th of February 2016. A lot has been reported and the proposed changes have been celebrated widely. But...the change of the negative investment list can not be done by a press conference nor by the announcement of a economy package. The current negative investment list is based on a presidential decree and this must be changed before it comes into force. The last changes of the DNI have proofed that lots of to-be-changes have been announced early in advance and short before signature of the decree disappeared due to national interest or any other unknown and undefined influences. There are several proposed limitations which are not defined in detail. Exactly those details might become the crucial point for foreign investors once the opening is defined in more detail. For sure there will be a change and we can expect a deregulation of certain items but we wait until the new regulation is signed and officially released before making any false hopes to our clients and followers. The coming two months will be a crucial phase for the opening of Indonesia's markets towards foreign investment. Planning is advisable and it is necessary to keep a plan B in your strategic pocket. If you need any kind of support to prepare your business expansion, market entry, joint venture plans we strongly recommend to keep in close touch with your consultants to figure out what will really happen the next couple of weeks in Indonesia. Indonesia is famous for quick and 180 degree changes in the last minute. So we will wait with our information to you until things are fixed and confirmed.